Adrienne Berene, a Breton mage, is the head of the Skingrad Mages Guild, even though another member in the Guildhall outranks her. She is the only Guild head in Cyrodiil who has the rank of Evoker, rather than that of Wizard. She sells a wide array of Destruction spells. She is very much a scholarly mage, spending most of her time during the day reading the tome that she has obtained from the Guild library: The Eastern Provinces. She does so at first in the library on the second floor, from 8am to midday, when she takes a two-hour break to eat lunch, and then from 2pm to 6pm. After eating dinner, at 8pm she resumes her studies, this time in her room, in the Living Quarters. She finally stops at midnight, when she calls it a day and sleeps for a good eight hours. If, for any reason, she cannot carry out these actions she will wander around the Guild building. She offers her services as a spell merchant whenever she is not sleeping or eating. She wears a blue velvet outfit and a pair of gold trimmed shoes, as well as carrying her book and a small amount of gold. She doesn't carry any weapons, relying instead on a particularly powerful set of Master and Expert level Destruction spells; which range from Drain Skill to Elemental Damage (on touch, target, and area) to Disintegrate Weapon. These are also the same spells that you can buy from her for a cheap price, since her Mercantile is only 6. When you meet her for the first time, her dialogue depends on whether you are a member of the Mages Guild or not. If you aren't she will say, "Hmm, what? I'm rather busy right now.Oh, is this about joining the Mages Guild? I suppose I could spare the time, if necessary." If you are already a member however, she will say. "I trust you have good reason for interrupting me?" 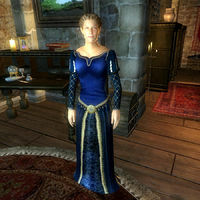 Not surprisingly, she gets annoyed when you ask her about Skingrad: "What? You want a tour? Can't you see I have a lot on my mind? Go bother a beggar or guard... they stand around and chatter all day." She does, however, offer some information about the guild in general: "There's at least one person in every guild hall who offers spells; check at every hall to make sure you don't miss any." She is very fond of the Arcane University: "It's been the home of the Mages Guild for the longest time. You should see the library they have there! It's the only place worth visiting in the Imperial City, if you ask me. I only make the trip if I can't find a specific book here." If you ask her if you can join, she will tell you "You're interested in joining? Great things will be expected of you. Are you sure you're ready for it?" If you say no, she will remark: "Well then. If you re-think your decision, I'll be around." If instead you choose to join she will pronounce: "Then you are now an Associate of the Mages Guild. You must receive a recommendation from every local guild hall in Cyrodiil before you may advance through the ranks of the guild. In the meantime, as a member of the guild, you now have full access to the guild halls around Cyrodiil. Only the Arcane University is closed to you." She is so involved in her own studies that she seems to have trouble keeping track of her chapter members and to make matters worse, it was one of her outbursts that forced one of her chapter members, Erthor, to study the art of magic elsewhere. When you wish to obtain her recommendation she will admit: "I'm afraid I haven't given it much thought. I'm rather busy, you understand. My research occupies nearly all of my time. Now that I think about it, I do have a small problem concerning Erthor. He's one of the guild mages here. Think you can do something about it?" If you say you're not ready she will be disappointed: "Very well. Come see me when you're ready, and we'll get started." In that case, If you mention the recommendation later on she will realize: "Oh yes. You still need that, don't you. Well, are you ready to take care of that matter for me now?" After agreeing to the task she will be pleased: "Excellent. I just don't have the time to search for him again, but I do need to consult him about some notes he borrowed. You might want to ask around, and see if anyone can be of some help. Let me know when he's back, and you'll have your recommendation." When asked about Erthor she will admit: "He's... well, an interesting fellow. Sulinus Vassinus can tell you more about him, if you wish to know. Sulinus should be around here somewhere. Talk to him if you'd like to know more about Erthor." If you bring up the recommendation again she will ask: "Any luck finding Erthor yet? I'll need to speak with him before I can feel your recommendation has been earned." After you have found out where Erthor is, you'll refresh her memory when you tell her: "Oh, I do remember telling him to go there... hmm. Well, we'll just have to do something about that, won't we? By we I mean you of course. I have something that may help - it's a basic fireball spell, in case you need to defend yourself. I'll be here when you get back. Good luck!" She will then teach you the Weak Fireball spell. If you pursue her about Erthor she will exclaim: "You said he was at Bleak Flats Cave. Haven't you looked there for him?" Once you have located Erthor and escorted him back to the guild she will grant you her recommendation: "I've spoken with Erthor, who seems to be all right. Good work. I'll see to it that your recommendation is sent in, as soon as I have a free moment. As I've said, I am rather busy. I'll get to it eventually though, I assure you." If you return to Adrienne after you have all recommendations she'll point out: "You have all the recommendations you need, I believe. Raminus Polus will want to speak with you. You can find him at the Arcane University." Adrienne's unworldliness is a regular topic between her fellow Guild members: "Have you spoken with Adrienne today? ", "Yes, I did, in fact. I didn't think she was paying attention though." The townsfolk of Skingrad have different opinions about the head of the local Mages Guild chapter. When asked about rumors they will say: "I hear Adrienne Berene is quite a mage. Of course, it's not like she'd bother to stop to talk to you in the street." and "I think Adrienne Berene is the ranking mage at the Mages Guild in town. Typical snooty mage." Also, when you visit the guildhall to receive a recommendation, the other guild members will hint at her persona. Druja will tell you: "Oh no, that's Adrienne's job, not mine. If you ask about it, don't be surprised if she's annoyed. She doesn't like being interrupted." Vigge the Cautious will agree: "Adrienne is in charge. You'll need to speak to her about it, if you can tear her away from her latest book." And Sulinus Vassinus will also add a comment: "Have you met Adrienne Berene, our Skingrad Mages Guild head? Not the most pleasant person, I'll admit. Don't mind her." There is a small inconsistency between dialogue and subtitle when Adrienne greets you at the start of the recommendation quest. The dialogue says "I trust you have a good reason for interrupting me?" while the subtitles say "I trust you have good reason for interrupting me?" Esta página foi modificada pela última vez à(s) 23h43min de 24 de dezembro de 2013.